IIM Ranchi has released the shortlist for admission to PGDM (2019-21) batch. Candidates can check their admission status for the second round of interview. Here's all you need to know about the Admission Process, cut-off and eligibility criteria for the 2019-21 batch of different courses being offered at one of the top b-schools in the country. IIM Ranchi Admission Updates: IIM Ranchi has released the shortlist of the selected candidates for the second round of screening. The candidates who have been selected will have to appear for the WAT and PI round which will be conducted at the allocated PI centers of the institute. Candidates can visit the official website of IIM Ranchi to check their admission status now. Candidates are required to input their registration number, DOB and e-mail id to check the admission status. Here is how the Shortlist window appears. The institute announced its admission criteria for the PGDM 2019-21 batch few days before. The CAT 2018 cutoffs prescribed by the institute is quite high at 95 percentile which is even higher than the cut off prescribed by IIM Ahmedabad, Bangalore, Calcutta and other top IIMs. The institute however awards equal weightage to CAT 2018 score, Profile and the PI round performance while preparing the final merit list for admission. Also, there is no separate application fee for applying to IIM Ranchi as it is included in the CAT 2018 Registration Fee. 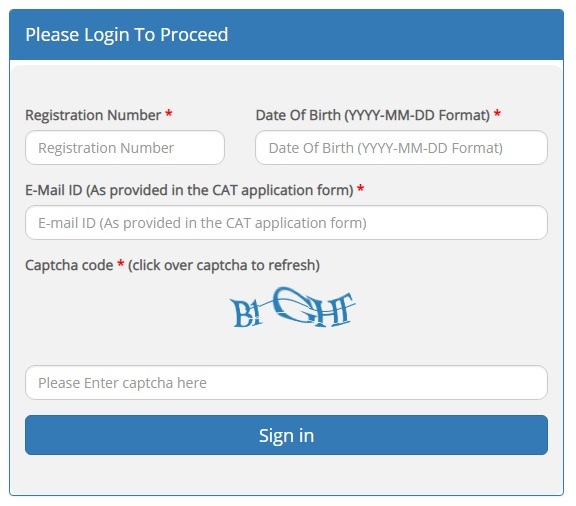 Candidates registering for CAT 2018 had the choice of exercising the option to be considered by IIM Ranchi for admission to the programme column of CAT 2018 application form without paying any separate fee. IIM Ranchi may change CAT cut off after the meeting of IIMs’ Directors. Post Graduate Diploma in Management is a two year full time residential programme. IIM Ranchi admits around 120 every year to its PGDM programme. The programme is designed to help students learn and apply key managerial concepts and analytical tools. It equips them with requisite knowledge and skills required for playing leadership roles in various corporate settings both in India and abroad. Students are also provided with the opportunity to develop their communication, leadership, interpersonal and networking skills, all of which are critical in today increasingly competitive world and fast changing business environment. Some of the core subjects covered in this course are Marketing Management, Accounting & Finance, Economics, Information Systems, Operations Management, Organizational Behaviour & Human Resource Management and Strategic Management. The first batch of the Post Graduate Diploma In Human Resource Management (PGDRM) at IIM Ranchi will commence in June 2018. IIM Ranchi is the first IIM to start a postgraduate level HRM programme. The course is designed to help students understand the breadth and depth of HR management concepts. It also provides them with the know-how of how to apply these HR learning and practices to create synergy and competitive advantage for the business. Candidates aspiring to secure admission at IIM Ranchi post graduate level management programs for the year 2019-21 need to satisfy the below given eligibility criteria. Candidates must have a bachelor's degree (minimum 3 years duration) with a minimum of 50% marks or an equivalent CGPA (45% for candidates belonging to SC/ST/PwD Categories). Candidates need to apply and appear for the CAT 2018 entrance exam. They are also required to score the minimum prescribed sectional and overall score to be eligible. Candidates appearing for the final year bachelor's degree or equivalent qualification examinations are also eligible provided they produce a certificate from the principal/head of the department/ registrar/director of the institution/university certifying that the candidate is currently in the final year or is awaiting final results. They would also need to submit their mark sheet and degree certificate of the final year degree certificate before December 31, 2019. Step 1: Candidates need to apply and appear for the CAT 2018 entrance exam. They must have also scored the minimum required sectional and overall percentile in the exam to be eligible for the shortlisiting process. IIM Ranchi prepares a category wise list of the shortlisted candidates for the WAT and PI rounds. Step 2: All the shortlisted candidates are required to attend the Common Admission Process 2019 ­(CAP 2019). CAP 2019 constitutes of both the Writing Ability Test and Personal Interview Rounds. Candidates who do not meet the minimum required performance criteria in the WAT and PI rounds will not be considered for the final selection process. Step 3: After the successful completion of the WAT and PI rounds, IIM Ranchi makes admission offers to successful candidates. The final selection of the candidates is made on the basis of Consolidated Merit List (CML). The list is prepared using a diverse set of attributes that includes the candidate's perfomance in the CAT 2018 and the WAT & PI rounds along with their past academic profile, work experience, and diversity among other factors. Step 4: IIM Ranchi will make the Final Admission Offer to the candidates around the last week of April 2019 on the basis of Final Merit Score. Candidates can access their Final Merit Scores on the official website of the IIM Ranchi. Step 5: Candidates who receive the admission offer from IIM Ranchi will need to send the acceptance within the stipulated date along with an Offer Acceptance amount of Rs.100,000/-. The CAT 2018 Cut-offs announed by IIM Ranchi are the highest among all the IIMs so far. IIM Ranchi has announced the CAT 2018 Cutoff at 95 percentile for the 2019-21 batch which is even higher than cutoffs announced by IIM Ahmedabad, Bangalore and Calcutta. It is however expected the institute might change its cutoff range after a meeting of the IIM Directors. The admission shortlisting process for the final selection round at IIM Ranchi awards 100% weightage to CAT 2018 score. Candidates need to score a minimum sectional percentile of 80 percentile in each of the three sections of CAT 2018 i.e. Quantitative Ability (QA), Data Interpretation and Logical Reasoning (DILR) and Verbal and Reading Comprehension (VARC). Candidates also need to score the minimum overall percentile of 95 percentile in CAT 2018. If candidates do not score the minimum required percentile in CAT 2018, they will not be considered eligible for shortlisiting for the final selection stage. All the Candidates shortlisted for PI process will have to attend both the WAT and the PI which is a common process for admission for all the participating IIMs. All the shortlisted candidates are eligible to participate in Final Selection Round for IIM Ranchi admission process. The final selection round consists of Personal Interview (PI) and Writing Ability Test (WAT). The final selection round will be common for the IIMs who are participating in the Common Admission Process (CAP) 2019. IIM Ranchi is coordinating CAP 2019. IIM Ranchi selection criteria after final admission round awards 30% weightage to CAT 2018 Score, 30% weightage to Personal Interview(PI), 10% weightage to Written Ability Test (WAT) and 30% weightage to profile. Candidates who do not obtain the minimum required scores in the WAT & PI rounds will not be considered for the merit list. The minimum scores will be decided by IIM Ranchi at its discretion. IIM Ranchi offers two postgraduate level management programs and the course fee for both the program for the students belonging to the 'Resident Indian' Category is Rs 15,10,000/-. This fee includes academic fee, hostel accommodation, mess charges, access to lectures, computer facilities, library and alumni fee. It however doesnot include laptop, computer, text books, insurance, personal expenses on travel, clothes and laundry charges. The fee fixation committee of IIM Ranchi may change the total programme fee for the 2019-21 batch.